The Atacama Large Millimeter Array (ALMA) has taken an image with delicate distortions. That, in and of itself, is not too awfully interesting; though, these distortions point towards a hidden galaxy—a dark, dwarf galaxy containing mostly dark matter…dark matter that seems to be one of the two missing pieces of our universe. 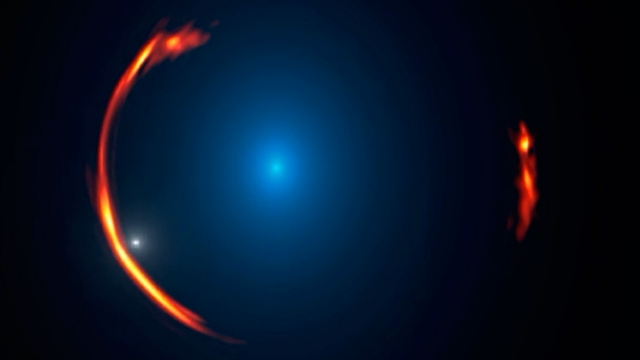 The image below, captured by ALMA displayed faint red arcs neighboring a galaxy (viewable in blue light below) almost 4 billion light-years away. The distortions of light are considered to have been triggered by the gravitational force from the dwarf dark galaxy right behind it. NASA explains, “We are much more certain what dark matter is not than we are what it is.” We certainly know that dark matter does not discharge or absorb light, making it completely invisible to our telescopes as of now. And even though we have no known techniques of viewing dark matter, all matter has gravitational force, which has an effect on nearby matter (even light). As predicted by Einstein’s theory of general relativity, the gravitational forces of certain entities modify light and cause a lensing effect, which is called as gravitational lensing. This provide hints about adjacent galaxies, even when they are very far away or, in this scenario, invisible. We can spot these invisible objects in the same exact way that you can see rain drops on a window. You know they are there because they alter the image of the background objects. The study suggests that we may have not been seeing most of dwarf galaxies because they are made up generally of dark matter. For almost two decades, scientists have been seeing same type of distortions but called them as “discrepancies.” This finding could explain those discrepancies and unwrap possibilities for ALMA to discover alike objects for contrast as well as help astronomers find out more about dark matter.